How do I Fix Stanley Pocket Door Hardware? Repairing a sliding patio door is not difficult unless broken glass is involved, and even then the hardest part of the job is lifting the door out of the track and then back in again. A broken window is one of several problems that necessitate door removal; the others are door roller hang-ups and tracking problems. Once the door is off, closer examination of the rollers and tracking assembly will help pinpoint your sliding problem. 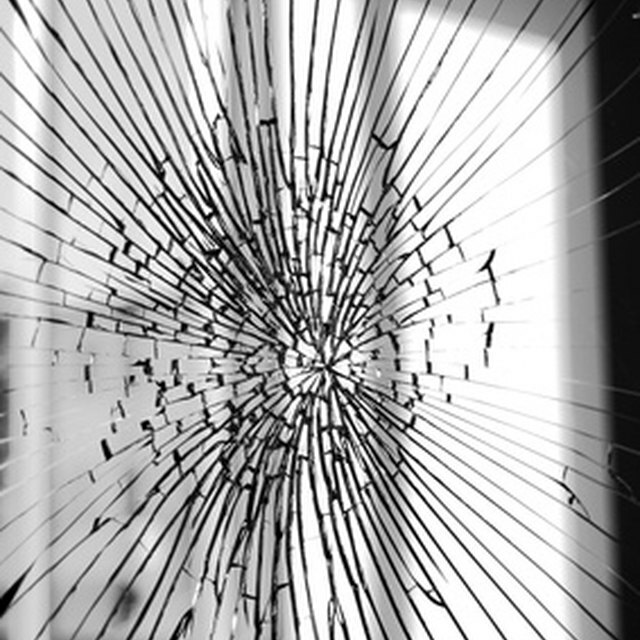 Broken glass is one reason a sliding patio door may need repairs. Grab the sliding patio door on each side, lift, and pull inward, then lift again to remove the door from the upper track. If the door is difficult to lift, locate the screw openings at the bottom of the frame and use a Phillips or flat-head screwdriver to loosen the roller screws. Try lifting again. Test the wheels for performance once the door is out of the track. Make sure they roll freely and are not damaged. Remove broken wheels by unscrewing the screws at the door's bottom with the screwdriver, taking care not to disassemble the frame from the glass. Install new wheels in the reverse of how you removed them. Clean out the tracking assembly with a rag, removing dirt, animal hair or any other buildup. A track repair kit will cover a track that is not too badly damaged, and allows the door to slide properly, restoring an even glide. Remove the screen door if the broken glass is in the stationary panel. Locate the metal piece over the fixed panel that prevents outsiders from removing the door, and pry it up with a flat-head screwdriver. Take out the screws from inside the doorjamb to remove the fixed panel. Now you are ready to lift the door out, using a pry bar to loosen it if necessary. Grab the door on each side and lift the panel as far up into the groove as it will go, then angle the bottom of the door toward you and pull it out from the groove above. Lay the door with broken glass across a large table for support. Remove screws from opposite corners, top right then bottom left. Loosen the frame and take out the rubber strip running around the glass panel. Separate the two halves of the frame and you should end up with two L-shaped pieces. Lay out the replacement glass, letting the side and top overhang from the table, enabling you to work on just the L-shaped portion. Install the rubber strip along the two edges, then tap the L-frame back into place with a rubber mallet. Do the same on the remaining L-shaped portion and replace all screws, using a screwdriver. Insert the stationary section of the door by lifting it up into the groove in the upper track. Hold the door at an angle while raising it, until you can rest it once again on the bottom track. Reinstall the fixed strip and replace the outside cap. Repeat the door installation process for the sliding portion. This time, let the top wheels drop back into the top track, and set the bottom wheels into the grooves on the bottom track. Use a blanket underneath to protect the new piece of glass while you work on it. Glass panels are available in standard sizes, so finding the right match should not be difficult. Only install safety glass in a sliding patio door.